Holy Island has some sort of magical and mythical quality about it and when you cross over the water it really does seem as if time stands still. Marvel at the Priory ruins, go plodging in the rock pools and spot birds from the wildlife hide. An afternoon spent on an island is a real adventure. Just make sure you check the tide times before setting off. You are never too young to develop a love of reading and a good books and Barter Books in Alnwick is a special place where you can nurture this love. Children can take their old books that they’ve grown out of and ‘barter’ them for store credit. There’s a welcoming children’s area with hundreds of books to choose from starting at just 30p. Don’t forget to look up and watch the trains travel above your head too. If your toddler loves diggers, they’ll love the Lady of the North. Climbing her really is an adventure (you will need to have a firm grip of their hand in places) but the views of the nearby quarry with it’s dumper trucks and lorries hard at work feel as if Bob the Builder has been brought to life. Stick Man is a favourite story of most toddlers and there’s a fantastic, easy to navigate trail through the woods in Kielder. Simply start at the castle visitor centre and follow the signs. There are activity boards along the way and it’s all completely free. The ducks at Felton must be the happiest ducks in the world. If you pop into the Running Fox Bakery by the river, you’ll find a basket of ‘duck bread’ by the door which is free for customers to take and feed to the ducks. It’s a lovely little spot and toddlers love it. 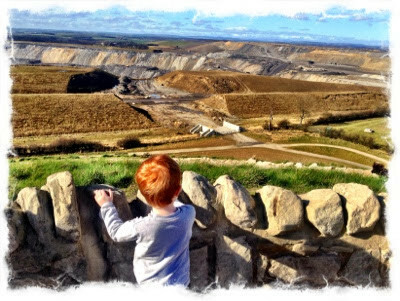 For more free ideas for days out in Northumberland, take a look at this post from North East Family Fun. For even more days out ideas around the north east of England and beyond, follow North East Family Fun on Twitter, Facebook and Instagram.